Come watch an alpaca being shorn. It happens only once per year so if you miss it, you'll need to wait until next year! Full and fluffy until their winter coats come off....... you'll be surprised at how they look when they are naked! Bring your camera for before and after pictures. Feel how soft and warm alpaca fleece is and check out some finished product at our on-farm store Gallery 109. 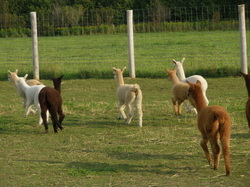 With luck, in addition to shearing you may be able to see the first 2012 babies (cria) on the ground. Now open week-ends 10am-3pm or by appointment, Gallery 109 offers a collection of one of a kind luxury alpaca products as well as unique gifts and collectables from local artisans. We are pleased to open our doors as a host farm for this year's farm tour. 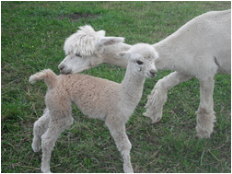 Come see the alpacas, touch the fibre, see how it is made into luxury products. Bring the family for a day in the country. One day only, Saturday October 1. TheTour goes rain or shine......so dress accordingly. The Tour is for everyone, plan to start early as the Tour ends at 4pm. There will be local produce available to purchase. We promise you will end your day enriched by the diversity of farming in Headwaters Country! There is nothing cuter or softer than a baby alpaca. Pack your picnic and come have lunch for a visit with our 'new arrivals'. Don't forget your camera! Come and see carding, spinning and weaving demonstrations and the wonderfully warm luxurious product locally produced from our own alpaca fibre. Sponsored by AFCO (Alpaca Fibre Co-Op of Ontario) and hosted by Alpaca Central. Marion Satchwill, Dye Specialist will lead the workshop and will show the use of various types of dye with alpaca yarn. A comprehensive 2.5-day, hands-on workshop. The value of alpaca fibre can be significantly affected by poor shearing practices. Learn how to safely shear your own herd and achieve optimum return. Ruth manages the Natural Fibre Testing Laboratory at Olds College, Alberta; is a qualified fibre testing technician; a Certified Camelid Fibre Classer; a Certified AOBA Judge; a volunteer with the Canadian Camelid Fibre Co-op; a founding member of the Canadian AgriFibre Network; a Wool Judge; a Suri Llama Keuring Inspector, and teaches Fibre Workshops extensively throughout North American and overseas. 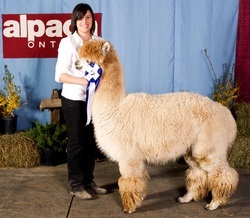 Come and visit the ALPACA CENTRAL farm showcase and watch ROYAL LEAR’s award winning progeny in the ring!! Alpaca Central has a boutique at Wintersinger's Tree Farm at 5837 Third Line, Hillsburgh. Come and browse for that perfect alpaca gift while you pick out a tree!! Yarn or rovings for the fibre artist in your life; cozy warm socks and insoles; luxurious duvets; a selection of handknit hats, scarves and mitts. All natural and locally made from our own alpacas. Treat yourself and someone you love. Discover where the food on your plate really comes from and what goes on behind the scenes at the farm. Visitors will have the opportunity to visit farms and agri-businesses in the East Garafraxa and East Luther townships and see alpacas, beef cattle, dairy cattle, sheep, horse breeding facility, grain elevator/custom cropping operation. The tour will showcase the diversity of farming operations in Dufferin County, where agriculture is one of the region's largest industries contributing to employment and local economic prosperity. Not only will the tour showcase agriculture as a vital industry within our economy, but will show visitors the tangible connection between the food they eat and how it is produced and grown. For many who farm in Dufferin County, their business is more than just a business - it's a way of life! Families have been farming in this region for generations and continue to provide food for not only their families, but for their neighbours, and their communities. Visitors can pick up a passport at the Hills of Headwaters Tourism Office between 9:00 am and 2:00 pm on the day of the tour. In the passport they will find a map of all the farm locations participating in the tour. Portable washrooms and hand-washing facilities will be available at each location, and select locations will provide food concessions (identified in the passport). We ask for a donation of non-perishable food items or cash for the local food bank as your admission to the day. Pack a picnic lunch, bring your camera and meet our 2010 newborn alpacas. Baby alpacas are called 'CRIA' and most are born during the summer season. There is nothing cuter or more curious than a baby alpaca. Visit us, relax and enjoy the view! There will be educational displays and you can browse our selection of luxury products locally made from our own alpaca fibre. Watch the shearing in action!! 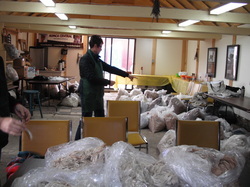 See the fleece go right from the animal to the carding machine and onto the spinning wheel. Here it will be made into yarn and then move on to the weaving loom where it will be made into a soft, luxurious garment. Alpacas are shorn only once per year, so this is your only chance to experience ' spa day' for the alpacas. Cuddle the love of your life in the warmest socks, mitts, hats, scarves and duvets all made locally from our alpacas. Treat your sweetie to some luxury yarn or roving processed at the local mill for that special project. In co-operation with Sire Power Alpacas our objective is to provide alpaca breeders with an opportunity to kick-start their 2010 and 2011 breeding program. Attend this event to view and book breedings to an excellent selection of high-quality studs. Each farm showcasing their studs at this event will offer spectacular savings on stud fees for this event only.